Skype is constantly working on improving their app, and the Android version of the software just got two new features. 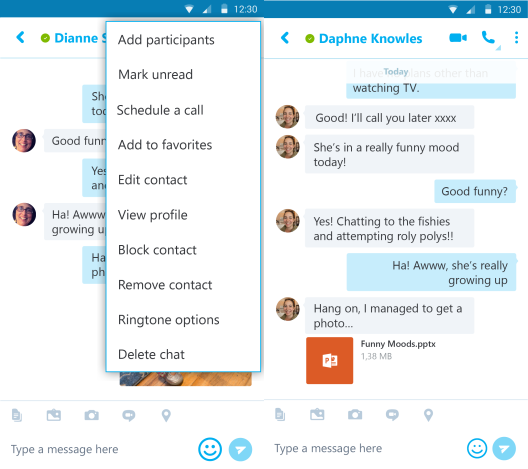 One of them allows users to schedule calls, and the other one enables users to open Office files directly from their Skype for Android app if they provide a link to the documents in the app. This way, users will be able to better manage their schedule without needing to use additional calendars and they will also be able to work more easily and fast because they won’t need to access multiple apps before reaching the wanted documents. In order to create a calendar event in Skype for Android, users will only need to tap on a contact from their contact list, and then tap the menu which is situated in the top right corner and select “Schedule Call” from the list. If users want to open a Microsoft Office document they received on their Skype app, they just need to tap the received document, no matter if it is a Word document, an Excell spreadsheet or a PowerPoint presentation, and the file will automatically open in the right app, without users needing to leave their Skype conversation to manually open the saved file with the appropriate app. Users who would like to have the new features will need to download the latest version of Skype for Android from the Google Play Store. The company is constantly working on ways to make the users’ lives easier, so we are expecting the application to be further improved with other features that will allow us to use the app in ways we would never have thought we could. Until then, we can enjoy the current form of the software which is already quite useful. Video calls and voice calls are now perfectly combined with a chatting service that can make your work a lot easier.